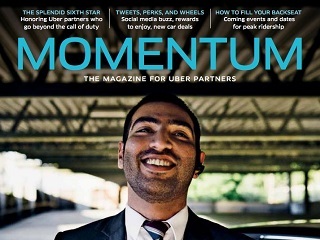 Momentum is on its way to drivers in select U.S. cities. The catch: you have to be a driver with the service, in a select geographical area, to receive a copy of the first issue. But no doubt if the quarterly offering is well received, that purview will be expanded. Momentum, which Uber employees devised and put together over the past five months, is launching in six markets: Boston, New York City, Chicago, Ohio, Oklahoma and San Francisco. The reason: Uber says it wants to better connect with its drivers. Momentum’s launch issue includes stories about how to get exercise when you’re behind the wheel, the best places to eat on the go and where to find restrooms when you’re on the clock. There’s also a profile of uber Uber driver Sofiane, who has clocked more than 20,000 trips for the service in the Bay Area. Read the rest of Shontell’s piece here.